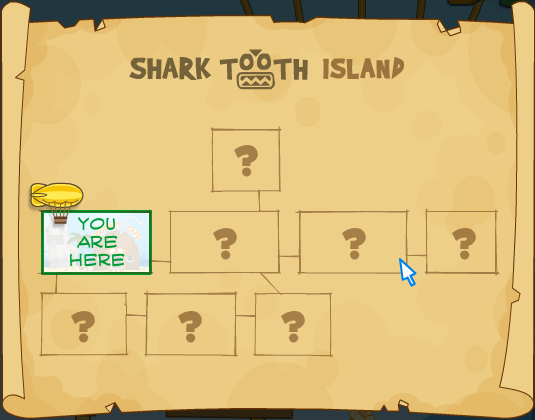 Shark Tooth Island is being terrorized by the great Booga Shark, but the only person who can save them is on vacation! Take Professor Hammerhead's place, and, with the help of a native islander, calm down the shark. And then rescue the Professor, of course! Let's visit the shark! Wait... not yet! First we need to put it to sleep! Go right and talk to the guy near the Coconut Cafe. He will give you some carbonated coconut milk. Go all the way right to Booga Bay. Get the grass skirt from the guy and put it on. You will now look like a native islander, whether you like it or not. Take this and go left, and to the Ancient Ruins. Avoiding the coconuts, move the huge block under the vine, and climb onto it. Drop off, jump up, and then make a huge leap to the left. You'll land on the roof. Go right and collect the page from Hammerhead's Journal. Now do the same, but climb all the way up to talk to the Medicine man. He will give you some instructions, and you can hop off the platform. Then hop off the roof and go into the building. Once you're in, you'll arrive at a swinging platform. Avoid it, and drop into the water. Swim left, and jump onto the log to jump over the block in your way. Keep going, and when you reach the end, make your way up. Make sure you reach the left side, where the green picture of a shark mouth full of teeth is. Click on it, and you'll see it close up with the key at the bottom. You need to punch in the equivalent of OPEN in to the teeth, and then click the triangle to open the door. In short, just click the teeth in this order: #2, #6, #7, #4 (from top left to bottom right). The door will open, and you can go inside. Drop down next to the vine and swim left. Jump onto the last log, and you will be at a huge statue with a caterpillar crawling around it. You need to get past this barrier without being hit by him. You can do this by sort of chasing him around the statue. When you're at the top, ignore the platform and jump off. Swim left, and onto the hallway at the end. You will find an old bone near the skeleton. Collect it, and come back. Hop onto the log, and then onto the platform above. Go right, and now you will have to get to the top of the statue again. Jump to the swinging platform above you, and hop off at the left side. Jump to the left, and try to avoid falling into the spike-lined pit or you will have to come up here again. Jump onto the moving platform, and jump off at the other side. Go left and drop down, avoiding the rope. Go left again and jump onto the pedestal to collect the Key Ingredient. Then climb up the rope and go up to reach the ground. Now go back to the Ancient Ruins. Move the big block under the vine and climb up. Drop off, jump up, and click "GO UP". Luckily, there will be no coconuts up here! Make your way up and talk to the Medicine Man. Give him the items you found, and then take the calming potion to Booga Bay. Swim across, and go to the mini-island where the guy is with the cannon. 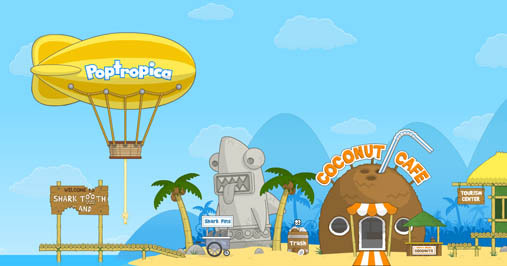 Click on the cannon, and then fire the calming coconut out into the bay. The shark will eat it and go to sleep. Now swim right and onto the next mini-island. The Professor and the kid will start following you, and now take them back to the mainland. The once-crying lady will now give you the island medallion as a reward. Yay! You've won the island!